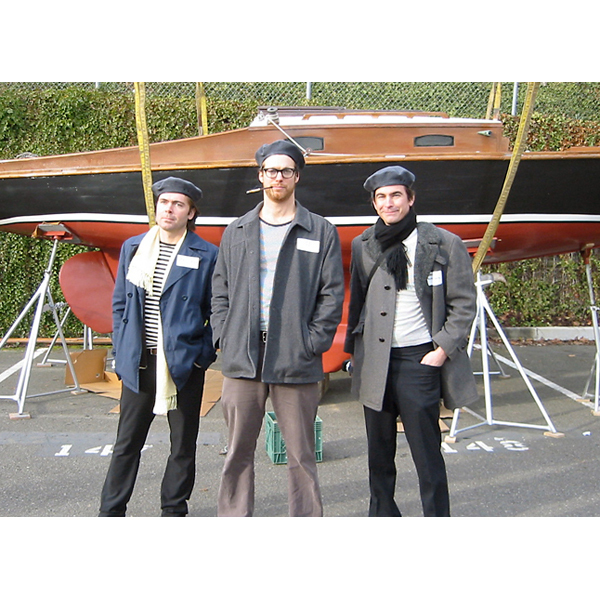 On February 2, 2007, our friends SuttonBeresCuller were scheduled to install a sculpture called "Ship in a Bottle" at the Tacoma Art Museum. It was to be a tremendous undertaking, employing a giant crane to lift a 1956 Blanchard Senior Knockabout sailboat hull into the atrium at the museum, and the artists were going to have their hands full with the logistics of the installation. It was also a big press event, with several notable TV personalities scheduled to drop by to interview the artists- a detail which they frankly wanted no part of. Over drinks one night, it was proposed that PDL, fresh from installing a fake SBC sculpture at the Olympic Sculpture Park, should pose as SuttonBeresCuller at TAM, taking the heat off of the actual artists having to interact with the press. So PDL dressed as foppish, stereotypical "artists" with scarves, berets, and cigarette holders, and traipsed about, with badly-written nametags on, snottily acting like we were assessing the install, giving fake, unheeded instructions to the crane operators, and taking interviews. The Tacoma News Tribune, among others, took the bait, and, not knowing the actual identities of the artists, published a photo of us as SBC in their coverage of the event. Playing off the general anonymity of visual artists whose work usually gets more visibility than their faces do, the ruse was considered a success, to the frustration of the bamboozled local media.